When it is time to replace your roof, whether due to aging or weather damage, many homeowners lean toward asphalt shingles due to their affordability. Not many people are aware, however, that a composite slate is a high-performance and low maintenance alternative that offers long lasting beauty, all without the high price of natural slate. Composite slate is a synthetic roofing material that exhibits the natural beauty of slate or stone—with added durability and ease of installation. For homeowners seeking a more unique, high-end look for their next roof, composite slate is an excellent alternative to asphalt shingles. Developed as an alternative to asphalt shingles and a more expensive natural slate, composite slate offers a long list of benefits. It typically costs about half of what you would pay for a natural slate roof, all while offering performance and durability characteristics that compare favorably with natural slate as well as asphalt. Nearly indistinguishable from genuine slate, synthetic slate roofing is far more attractive than asphalt shingles. Synthetic slate roofs come in a broad palate of colors and textures to enhance your home’s paint color and architectural design. Its distinctive curb appeal makes it an attractive option for nearly any home style. Natural slate is fireproof, waterproof and long lasting, but tends to be brittle and prone to damage from hail, foot traffic and other conditions. Composite slate is composed of a state-of-the-art polymer blend that is simple to install and virtually maintenance free. It can be walked on without crumbling, comes with up to 50 years of warranty coverage, is resistant to freezing, thawing, wind and fire. By comparison, asphalt shingles usually last 10 to 20 years, making your up-front investment in composite slate well worth the money. Composite slates has been manufactured to reduce the effects of the sun as they contain advanced ultraviolet inhibitors to reduce wear. They are class 4 wind resistant (typically containing impact modifiers to help withstand storm damage) and class A fire resistant (they’re effective against severe exposure to external fires, are not readily flammable and do not spread fire). Green homeowners will appreciate the sustainable design of composite slate as well. Made from recycled products, the tiles are also fully recyclable at the end of a roof’s usable life. Synthetic slate tiles offer the beauty of natural materials without adding structural stress. Many of the Spanish tile and slate tile options are quite heavy, and some homes cannot handle the weight. Composite slate on the other hand is very light (lighter than asphalt shingles in fact) and won’t put an added weight burden on your roof – no extra support beams are needed. You won’t need precision cutting tools either. During installation, synthetic slate shingles can easily be field-cut with a utility knife and nailed into place with standard roofing nails and a pneumatic nail gun. 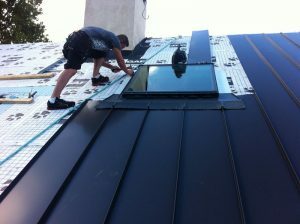 In fact, installation techniques are similar to those used for asphalt shingles. Due to their light weight, material delivery is much easier and cheaper as well. The initial cost of installing synthetic slate shingles is more expensive than asphalt and architectural shingles and less expensive than clay tile and authentic slate. As you’d expect, material and installation costs vary by region and roofing company. On average, though, you can expect an asphalt shingle roof to cost between $1.50 and $4.00 per installed square foot, while composite slate ranges from $4.50 to $7.00 per installed square foot (about half the price of natural slate). Costs are dependent upon material selection, warranty, installation requirements and other factors. All in all, composite slate roofing is an upscale alternative to asphalt shingles—without the hefty price tag of natural slate or stone. If you are not planning to keep your home, or are re-roofing a rental property, it may still be wiser to purchase asphalt shingles for your home. Available in a broad range of colors, styles and warranties, asphalt shingles are still a more affordable way to protect your home. However, for those planning to stay in their homes for years to come, nothing beats composite slate roofing in terms of good value. The long life expectancy of this material means that a roof doesn’t have to be replaced in 15 or even 30 years, and also that fewer repairs are needed during the roof’s lifetime. Synthetic slate is a clear winner in the long run! We Install Both Natural & Composite Slate Roofs! 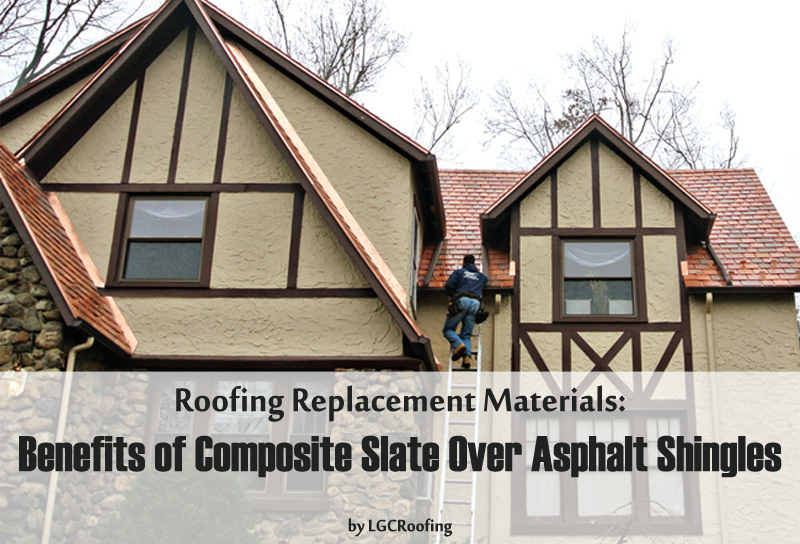 To learn more about the benefits of asphalt shingles or composite slate, or to request a no-obligation roofing installation estimate for your home, contact LGC Roofing. We’re a reputable NJ-based slate roofing contractor with over 30 years of experience in residential & commercial roofing. We never take shortcuts and ensure every step is done right! We are a DaVinci Masterpiece Contractor, install both natural (original) and composite slate roofs and are fully licensed and insured to do roofing and siding work in New Jersey and Pennsylvania!